Wingspan 9 to 11 mm. A rather attractive little moth, in common with other similar species, has metallic purplish forewings. There are two whitish cross bands and a large pale spot towards the end of the wing. Found in woodland and heathland. 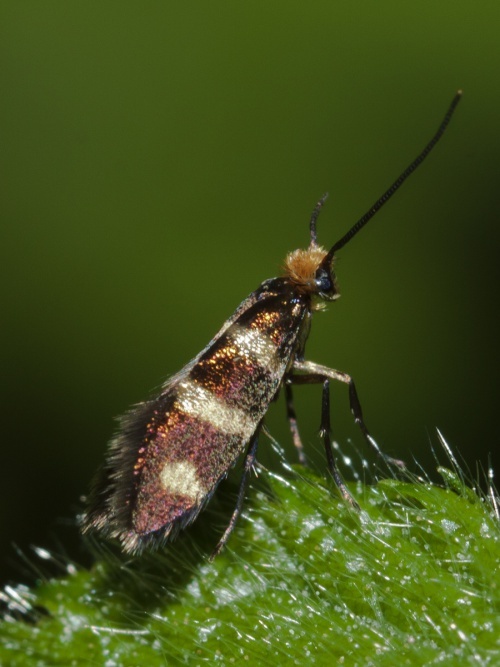 The adults are among those moths with working mandibles, and they feed on the pollen of a variety of flowers, especially those of sedge (Carex). Distributed widely but locally over Great Britain, very scarce in the east of the country. In the Butterfly Conservation's Microlepidoptera Report 2011 this species was classified as local. It appears to be uncommon in Leicestershire and Rutland, where there were no known records since the early 1900s until the one in 2013 from Martinshaw Wood. L&R Moth Group status = D (rare or rarely recorded).